Half-way through my first R1 session at the Sydney Motorsport Park, and I’ve just realised the alternative meaning of the phrase that Yamaha used as inspiration when developing the new, MotoGP-derived rocket-ship. Project leader Hideki Fujiwara coined “no excuses” as a more extreme version of the original R1’s “no compromise” motto — to emphasise that his team would have failed if the R1 didn’t better its rivals’ lap times. But after half a dozen laps on this stunningly light, compact, responsive and searingly fast four, the phrase rings true in a different way: if a rider is not quick on a bike as stunningly sharp as this, there are no excuses left. I know the bike is not to blame as I brake too soon for a half-remembered chicane, then turn in too early for the last left-hand bend and lose more drive on the exit because I’m in too high a gear. But the Yamaha does a great job of helping out, effortlessly switching its line with no loss of poise, and pulling hard even though the revs have dropped below 7,000 RPM. And, boy, does the R1 reward you when you get it right! The bike feels fantastically powerful, taut and racer-like as it drones down the start-finish straight, almost revving out in fifth at over 280 km/h before the 200 m board flashes past and I sit up and brake briefly, then flick down a gear and pitch the bike into a long, fast left-hander, which it carves through before howling off towards the following left-hand hairpin. The Valencia circuit has a very similar first couple of bends, and it’s no coincidence that I’m reminded of riding Rossi’s 2005 MotoGP championship-winning bike at the Spanish track at the end of that season. Even nine years ago a works M1 was a distinctly different class of bike from this production R1. Rossi’s racer produced 240 PS and weighed about 150 kg dry, so had an advantage of about 40 PS and over 20 kg even over this most powerful and light of street bikes. 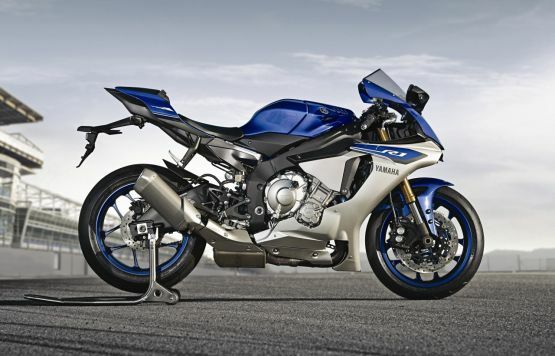 But the R1 has a fantastically light, precise, racer-like feel as well as serious power. 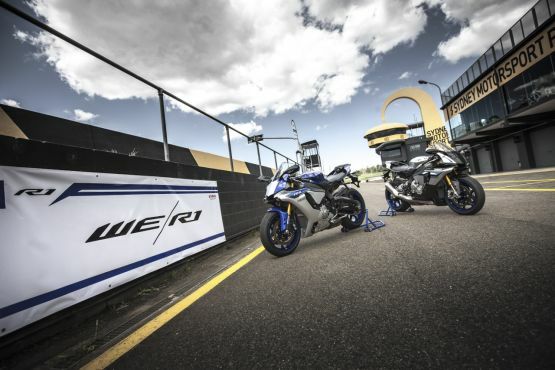 Its 200 PS and fuelled-up weight of 199 kg put it right up there with BMW’s S1000RR and the rest. And, equally importantly, its M1-derived electronics package is equally competitive — arguably the most advanced and refined of the lot.